JET exam 2018 is conducted by the Maharana Pratap University of Agriculture and Technology, Udaipur. The admission process is started from the 1 March 2018, and other dates are onwards. JET Agriculture conducted for admission in various courses Like- B. Tech. (Dairy Technology), B. Tech. (Food Technology), B.Sc. Agriculture (Honours), B.Sc. Forestry (Honours), B.Sc. Horticulture (Honours).Now the time for counselling for Raj JET 2018 for various colleges according to their marks that are scored in the final exam. Candidates are informed that the counseling of Rajasthan JET started from May 2018 and end on Jun 2018. The required documentation for the counseling is mentioned on the official website in the information brochure in detail. The Institution (colleges that are participating in counseling) and type of seats will be allotted by marks obtained in this examination and online option form filled by the candidates. After the JET Examination, all students are looking to fill up Raj JET Counselling online Application Form. Its process will be started very soon by the examination body. If students want to get full information of Rajasthan JET Agriculture 2018 Counselling then they can move towards the official notice. The notice is issued on the official website. 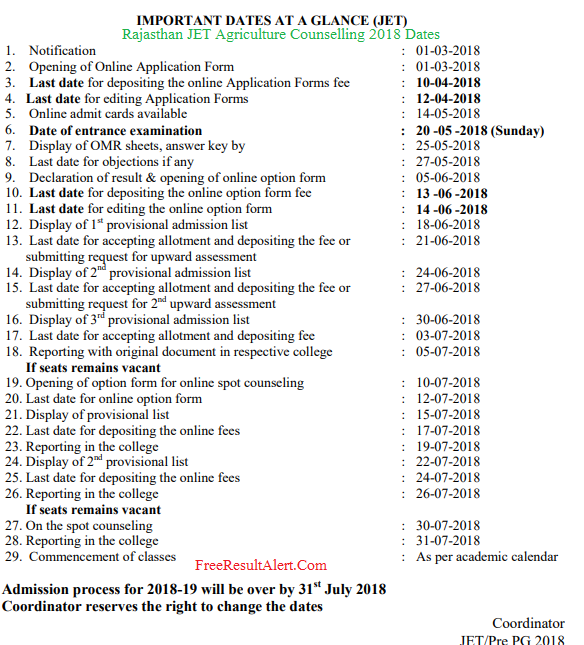 The following dates are announced by the official website of Rajasthan JET when the first time notification is out for the students. The starting date and ending date both are mentioned here. All the students that get the seat in the first round must report in the college that is allocated to you. If you want to upgrade your college then apply for the second round before the last date over otherwise you miss a great opportunity. The spot is the main round for the students that have lowest marks or at the last position in the cut off list. After this process all are can join the college and start the session Now are you are free for the preparation of the NEET Phase 2. Sir if jet 2018 1st list me private college me admission ho gya h … To vo bhi option form fill up kar sakta h kya??? Am I got govt. Agi collage ? Merei JET 2018 Mei 265 marks aayei h …category – OBC (NCL) ….mereiko konsaa college ya university mill saktii h …plz tell…?? May be govt college bikaner.. Your rank & cast category ? Sir. Jet ki councling ka results kb tak aa raha h.